Creating awareness through puzzles? It sounds different right? 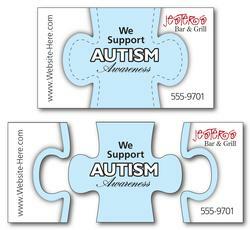 Yes, a 3 piece puzzle shaped full color magnet can be utilized for creating awareness on some grave social issue. It can be offered as a business gift or a business token at the end of some social programs or during the festival season. The customers will love to affix it against their refrigerator and look at it each time they open the fridge. This magnet can be offered against the payment of $0.09.